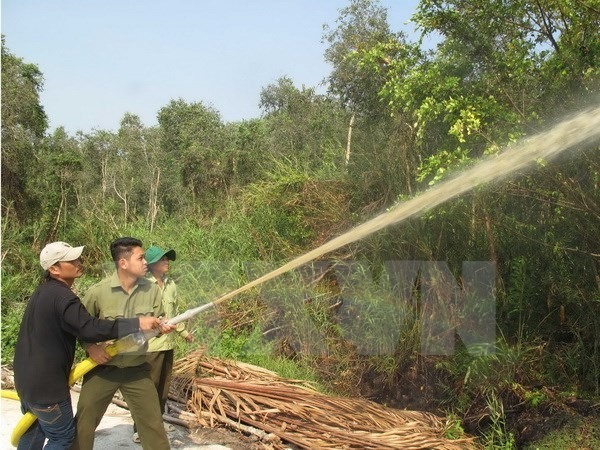 CÀ MAU — Prolonged dry weather has significantly increased the risk of forest fires in the southernmost province of Cà Mau, the provincial Forest Protection Department reported. More than 11,000ha of nearly 45,000ha of forest cover affected by the hot weather is facing dangerous and extremely dangerous conditions, Lê Văn Hải, head of the department, said on Wednesday. Faced with this situation, the provincial Committee for Forest Protection and Development has requested all sectors, local authorities, forest owners, households and individuals to strengthen the implementation of forest fire control measures. For key areas with high risk of fire, rangers and forest owners have been told to mobilise forces and equipment for fire prevention and firefighting around the clock during the dry season to avoid fires. Rangers, soldiers and locals can also be mobilised for assistance in case of fires, according to the committee.